I'll try and make this brief. I'm a 35 year old divorced father of two. If I had a job I'd be an employed 35 year old divorced father of two. It was never my intention to write about stuff like this, or to write about stuff like this like this. I didn't expect to be prompted into committing such a piece to public scrutiny. I should probably feel a bit embarrassed, but I don't. Why should I be? I'm a 35 year old divorced father of two. Anyway. I'll cut to the chase. I've got a bit of a crush on Patrick Wolf. Although this isn't a confession any more than it should be a surprise. He's an amazingly beautiful man. I don't really know anything about Patrick Wolf except that he sings wonderfully, in words that I can understand. And that sometimes he's like a glorious busker. 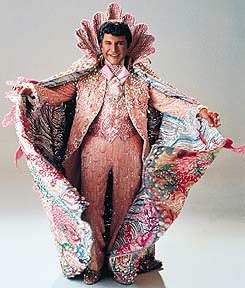 And sometimes he's shinier than Liberace. And other times he's darker than diamond. And he makes me smile and he, in turn, smiles like it's a new invention. And above and beyond almost every single other thing he makes every single other thing he does look incredibly natural and unforced . In fur or feathers. Or jogger shorts with leopard print ears. Or short sleeved sequined hoodies. Or one and a half red gingham shirts. Call it what you like. Star quality? The X Factor? All I know is that Patrick Wolf makes this 35 year old divorced father of two feel like telling you this series of gushing random comments, and hopes that they might fashion themselves into something coherent. He's got something I'm trying to define but I'm not sure that I can. It's not about how he looks or sings or acts, and yet it is about all of these things. He has it. And he wears it like it's an accident. i woke at 3am after 3 hours alseep. i just almost choked on my own laughter. Hmmm, will have to take your word on that one...!